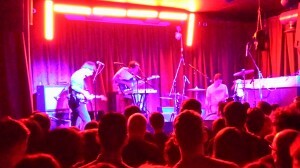 Tonight, San Francisco’s The Dodo’s play their second night at The Hoxton Bar & Kitchen, and the place is fit to burst. They arrive on stage and instantly launch into the huge build up that is ‘The Current’ from their latest outing, ‘Carrier’. From the get-go their sound is huge, and this is not what I was expecting from the quiet technical acoustic outfit I’ve been listening to for five years now. They seemed to take on a whole new shape when playing live. On stage we have drums up front, and one of the joys of seeing Dodo’s live (for a geek like me) is being able to see the varied and complex drumming patterns as they play. This is a band not like any other. With every track my brain was in overdrive trying to piece together how it worked and who was playing which of the parts. Their tracks take on a whole new level of complexity when you can actually see them in the flesh. Joe Haege completes the three piece on guitar and occasional keyboard. Second track in, ‘Substance’ sounds incredible, and it’s obvious this is a favourite with the crowd. Most people in the room are singing along. In terms of the mixing I think there were a couple of niggles with the vocal levels, but these were quickly resolved. 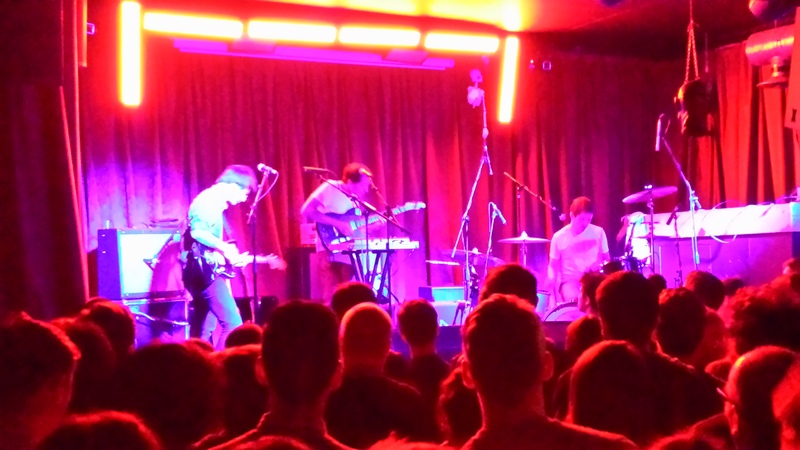 It feels like they are used to playing in a much bigger room than our humble East London venue. ‘Black Night’, from 2011’s ‘No Color’, is a real workout for drummer Logan Kroeber, and The Dodo’s really hit their stride on this track. Hearing them live, the emphasis is on the tunes and the changes rather than (on their impossibly produced records) being able to hear every strum and note of their guitars. Both versions work really well. 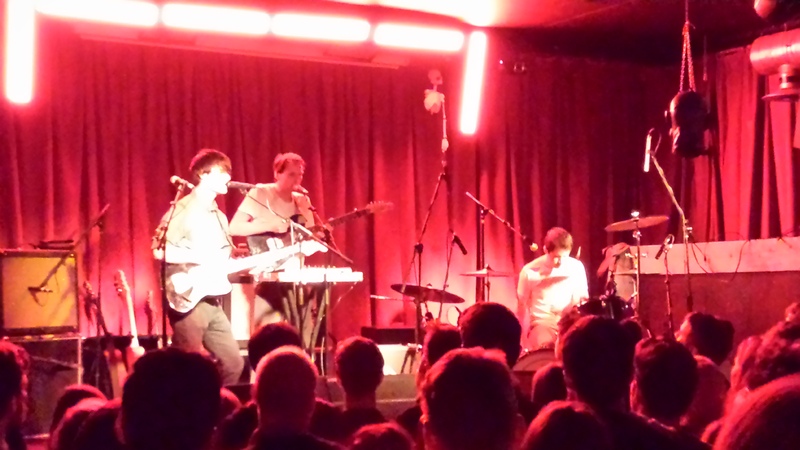 I really didn’t have The Dodos down as a band people would dance to like maniacs, but this gig is proving me very wrong. Mid-set ‘Relief’ is one of my personal favourites from this years ‘Carrier’ record. It’s the quintessential ‘folk-indie’ track I’ve come to love The Dodo’s for, with its gentle strums and harmonies. From being the loud band who started this gig, they have become a quiet folk band within this track, the transformation is incredible. The single ‘Confidence’ is the focal point of the set, and everyone in the room knows the words. It’s such a great track, and for me this will be their commercial breakthrough record. Fan favourite ‘Red and Purple’ from 2008’s ‘Visiter’ breezes in after it, and sounds sublime. Here is a track that they have absolutely perfected live. This is a bonafide classic by anyone’s standards. I could listen to this track over and over, and never tire of it. The encore is led by another huge record, ‘Transformer’. It’s a track that, like the opener, builds and builds. I really like this new sound they’re developing. In everything we’ve heard tonight it puts them somewhere in between Fleet Floxes, Grizzly Bear and Here We Go Magic. They are gentle, they can be intensely loud, all of their harmonies work flawlessly, and the complexity of their melodies both baffles and amazes me. As they begin to play lead guitarist, Meric Long, starts playing in the wrong key before having to stop the rest of the band – he got distracted by the swinging severed head left over by last night’s Halloween decorations! Ever the professionals they launch back into it and the crowd are whisked away in another dreamy melody. The Dodo’s are a cerebral live act, a band that makes you think, as you watch them play with and against each other’s melodies, whilst singing and dancing yourself into the floor. I very much recommend that you try and see them in the smallest venue possible for a similar show we were treated to this evening. It was incredible from start to finish, and I can’t wait to see them play again. This entry was posted in The Dodos and tagged Hoxton Bar & Kitchen, The Dodos by admin. Bookmark the permalink.